Greenwich sponsored the Special Live Viewing of the American Idol Finale held at the Cinema 5 of Greenbelt 3 on early morning of May 27, 2010. Show started at 8:00 am. and ended at 10:00 am. I felt so exhilirated watching the finale live for the very first time since I started following the phenomenal singing competition in America from Season 2 (where Ruben Studdard won) up to the present. Lee DeWyse and Crystal Bowersox were the Final 2 contestants who received the nod of the American public. I am amazed of the friendship that the 2 has developed for each other and how humbling it is for them to compete in the finals. I cried for 3 reasons: First, their friendship. Second, their very sincere humility. Third, what their life had been before stepping into American Idol. Both from Chicago, Lee De Wyse was a paint salesman while Crystal Bowersox was just a single mom taking care of her child. The finale also celebrated Simon Cowell's last season as judge. All American Idols from Season 1 performed in a special number, except David Cook who was not present. Paula Abdul was also a special guest who gave her last message for Simon. People enjoyed the free yummy food and drinks courtesy of Greenwich (of course!) -- unlimited pizza, pasta, softdrinks and coffee. 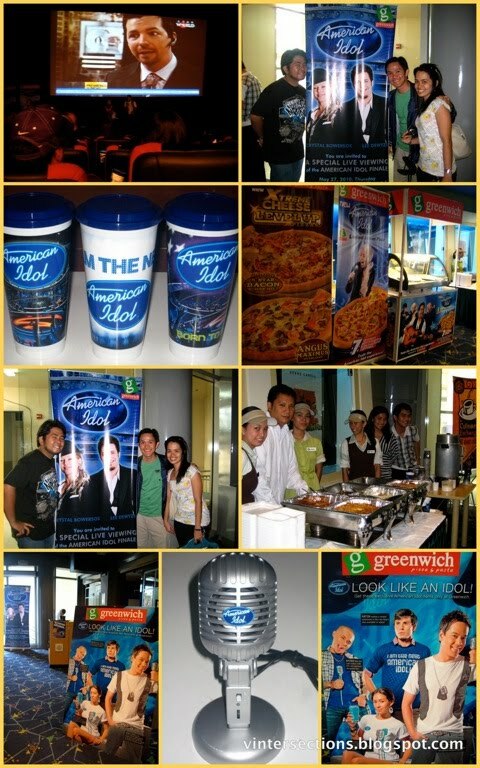 In between commercial breaks, Greenwich raffled off gift certificates, iPods, American Idol & Greenwich premium items. I felt the tension as the time got nearer to the final announcement. The whole Cinema 5 theater was almost filled up with American Idol fanatics cheering for their bet. I rooted for Lee. It was an exciting morning (in the Philippines) to remember. In the photos, fellow bloggers Ayet San Jose & Florencio Jusay, Jr. also joined in the fun. Lee DeWyse is the 9th American Idol (2010). For his final winning performance, he sang "Beautiful Day" which was originally sung by U2. Congratulations Lee!!! Thank you Greenwich for the successful event!